North Korea's Workers Party revised its 10 founding principles for the first time in 39 years this June to enshrine the hereditary transfer of power through the Kim family. 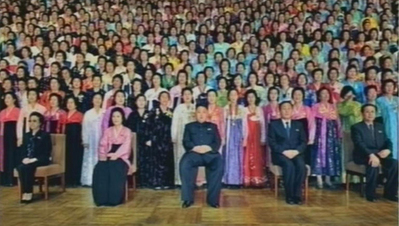 The regime's founder Kim Il-sung created them after appointing his son Jong-il as his successor in 1974. In North Korea, the 10 founding principles are considered more sacred than the regulations of the Workers Party, and the aim of the latest revision is to indirectly confer legitimacy on Kim Jong-il's third son Jong-un, the current ruler. Clause 2 of Article 10 states that the party and revolution must be carried "eternally" by the "Baekdu bloodline," referring to the Kim dynasty. The North inserted new clauses stipulating the Kumsusan Palace of the Sun, which contains the pickled corpses of Kim Il-sung and Kim Jong-il, as a sacred place to protect the images of the two leaders. At the same time, the phrase "completion of communist achievements" has been deleted, switching the focus purely to establishing absolute rule. In other words, the North has become a kingdom ruled by the Kim dynasty. In a constitutional revision in April 2012, the regime declared itself a "nuclear power" -- it must be the only country in the world to flaunt its nuclear arsenal in its constitution. It also boasts in the preface to the 10 founding principles that it has acquired "nuclear force" as "the backbone" of the country's "military power and economic solidarity" under the Kims. Clearly the North has no intention of giving up its nuclear weapons. The government here is seeking to get North Korea to apply international standards to the Kaesong Industrial Complex during upcoming talks scheduled for Wednesday. But one look at the revised founding principles shows what the North thinks of international standards. It is Seoul's weary task to try and find a new framework for inter-Korean relations and to continue negotiating with the North. A clear idea of the regime's twisted logic is essential to deal with it effectively.